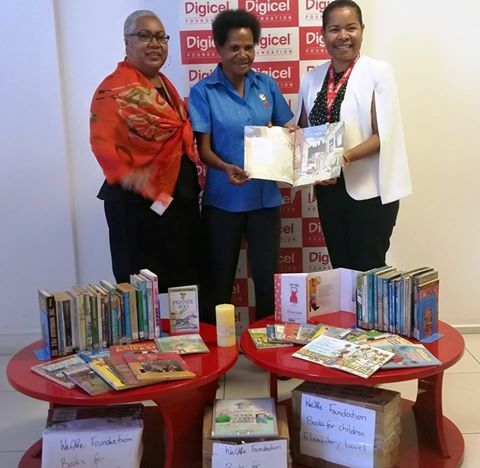 Digicel PNG Foundation today received 16 cartons of children’s reading books from WeCARe! Foundation. Digicel Foundation CEO Beatrice Mahuru said she was very grateful for the donation and thanked WeCARe for the kind gesture that will benefit the children in rural parts of the country. “We have built 488 classrooms and where schools have shown community ownership and good governance, we have returned 3 years later to reward them with libraries. These libraries need to be filled with books and I am so grateful for WeCARe! Foundation for sharing the books which were donated to them,” Ms. Mahuru said. WeCARe! Foundation Manager,Josephine Dromenge, said on behalf of the founder, Fr. John Glynn that WeCARe! was happy tobe part of the efforts to change the literacy levels of Papua New Guinean children, especially those in the rural areas. She described Digicel Foundation to be their largest funding partner and it was fitting for WeCARe! Foundation to give back in a small but significant way. Digicel PNG Foundation and WeCARe! haveenjoyed an eight-year-long partnership, with an annual funding budget of K210, 000 each year to strengthen their programs with the truly vulnerable of our communities – Women and Children at Risk. To date Digicel PNG Foundation has funded 488 classrooms and 15 libraries, 23 Mobile Health Clinics, 6 rural Health Aid Posts, 3 Women’s Resource Centres, co-funded 5 Family Support Centres in partnership with UNICEF and NDoH. We have graduated 260 grassroots community based teachers in early childhood development and learning and over 16,000 men and women are now equipped with basic business skills. Over 900 people with special needs, together with their families and communities have been impacted positively by the Community Based Rehabilitation Program; and the Men of Honour Awards – a campaign against violence in PNG, is the latest to the Foundation’s development portfolio. So far, we have 10 winners, 30 finalists and 162 nominations. Digicel PNG Foundation appreciates that change is not going to happen overnight, but it will happen. Established in October 2008, Digicel PNG Foundation has directly invested K65 million in PNG’s rural, remote and socially marginalized communities across all 22 provinces directly impacting over 500,000 people.